One Etsy seller understands the pain of eating half a box of pizza and being so full you're sick, but you eat just one more slice because you can't bear the agony of not having pizza taste in your mouth. 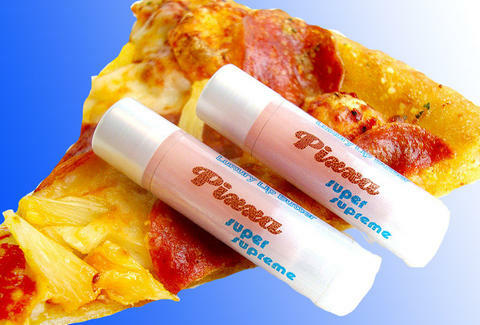 That Etsy seller is Regina Panzeca, and she has added a new flavor to her line of lip balms: pizza. She calls the flavor "Pixxa," saying, "Pixxa is just my personal fun way to say 'pizza.' It's goofy, kinda like a pizza lip balm!" It's kind of brilliant and now that it's here, it's hard to imagine how this didn't exist before. Panzeca tells Thrillist that it's not just a bland pizza flavor. "I made sure there are notes of Italian herbs, tomato, and even a hint of garlic in there. "I've had great success with my off-beat food themed lip balm flavors like Italian Sausage and Elvis Sandwich," she said, "so when I expanded my line some years later I wanted to add some more really wacky fun ones." Yeah. There's also Italian Sausage and Elvis Sandwich. She understands you. She's even got Snozzberry lip balm if you want your lip balm to reflect your sadness about the passing of Gene Wilder. The pizza lip balm might not be great for intimate moments with the garlic in there, but whatever, it's pizza all day long.